ITV’s The Suspicions of Mr Whicher returns with two new TV films inspired by the real life career of the celebrated 19th century detective. Paddy Considine (The Bourne Ultimatum, The World’s End) returns as Jack Whicher with the new films written by playwright Helen Edmundson. The original The Suspicions of Mr Whicher film was shown in 2011 and based on the best-selling book by Kate Summerscale. The first film “Beyond the Pale” is directed by David Blair (Accused, Bert & Dickie) and sees Jack Whicher has moved on from his role as Inspector at the Metropolitan Police to become a private inquiry agent. After being hired by a former Home Secretary to help investigate threats made against his son, Jack unearths the darkest secrets and finds himself in a maelstrom of betrayal and passion. The second film “Ties That Bind” is directed by Geoffrey Sax (Endeavour, Tipping the Velvet) and is about Whicher reluctantly taking on a divorce case after the law has just passed and what seems a fairly straight-forward investigation turns out to be disturbing after one of the key witnesses fails to attend court and is found dead. The Historic Dockyard Chatham was chosen as a film location where the production made use of a variety of spaces including exteriors at the street and gardens as well as HMS Gannet and interior spaces such as the Tarred Yarn Store. The Historic Dockyard Chatham is a popular film location due to the variety of cobbled streets, industrial buildings and extraordinary Georgian and Victorian architecture. Feature films Muppets Most Wanted (2014) and Les Miserables (2012) as well as TV dramas Mr Selfridge (2012-2014) and Downton Abbey (2013) have also chosen to film at this diverse Kent location. 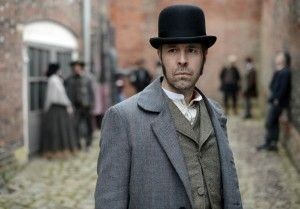 The Suspicions of Mr Whicher: Beyond The Pale will be shown on Sunday 7th September 2014 at 21:05 on ITV1 and The Suspicions of Mr Whicher: Ties That Bind which will be shown on Sunday 14th September 2014 at 21:00 on ITV1. 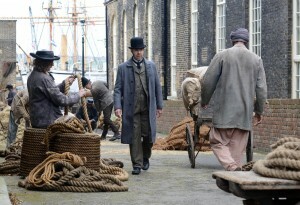 This entry was posted in Filmed in Kent and tagged The Historic Dockyard Chatham, The Suspicions of Mr Whicher film locations, TV Drama. Bookmark the permalink.